Nogal een zoete ingang, wel een donkere kleur. Smaakvol aroma, wel zeer lekker. Aroma: Malt, caramel, fruit, some alcohol. Body: Light to medium body, medium carbonation. Flavour: Malt, fruit, some caramel. Old-fashioned ’dubbel’ with light beige, stable head and very dark ruby brown colour, clear. Aroma of coffee grounds, bitter chocolate, walnuts, sherry, cloves, tomato, iron. Fruity taste, smooth and nutty, dryish, with coffee-like roasted bitterness in the finish, but little hops. One of those remnants of a bygone era in Belgian beer history, when ales just had to be good and decent, without further ambitions of complexity - and I have nothing against that, this type of beers deserve their place among the newer, more ambitious brews. Dark amber/brown colour. Sweet malty taste. Aroma of caramel and brown sugar. Very watery. Thin body. 25cl. Darg brown in the glass, white head. The beer starts malty, a bit watery, easy to drink. The mainpart is watery, not bad, slightly dry, a bit roasted. 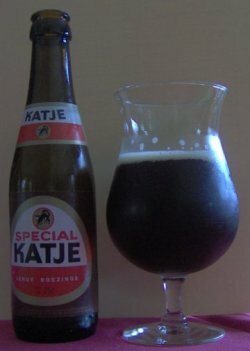 The aftertaste is medium, malty, caramel, roasted malt, slightly sweet, a bit bitter and slightly watery. --> nice, easy drinking beer, but not much aroma noticeable. bottle. Poured clear medium reddish-brown with a creamy beige head. Aroma of sweet tea with a light roast. Medium body, creamy mouthfeel with a tinny finish. Nice roasted malt flavour, caramel and nutty notes. few year old bottle, i guess, at kulminator . pours dark, white foam . no smell taste has hints of caramel and thats quite it . not much taste at all . 33cl bottle @Brugge BierFestival 02/02/2013. - Old-school speciale Belge, containing too much caramel (malts?) for its own good, porous and fluffy head, medium carbo and light mouthfeel. Very shy hops, watery overall. Drinkable like a grocery store pils or Palm - This beer went right down&under amidst the exceptional brews @BBF 2013. Bottle sample @ 19de Internationale BierHappening, Zottegem. Cuivrée, col fin beige. Arôme malté, léger grillé, rappelle un peu une version plus forte de la Jupiler Zero avec ici une note agréable de grains et de drêche. Palais est similaire, malté léger, le tout est supplanté par ce côté grains, brassin sortant juste du tank. Pointe de sucre brun, belle effervescence avec un petit clin d’œil café discret. Bière qui au final n’est pas bien méchante, simple et efficace et pour moi, s’en retrouve meilleur que d’autres grands noms des pils belges. Garde cette fin de bouche rappelant une bière de table plus centré grains et malt.